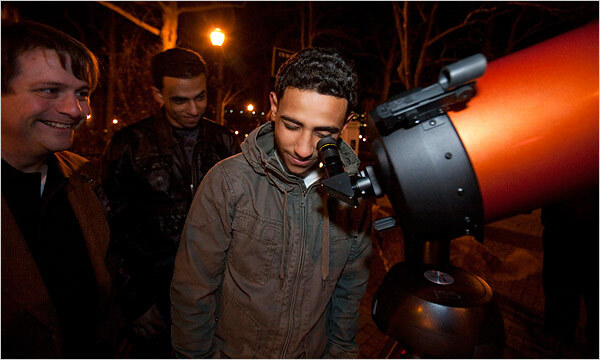 “While Times Square is not known for star gazing — the celestial kind, that is — and few people would normally venture onto a pitch-black ball field in Inwood to see the constellations, two unrelated, if not unlikely, projects hope to turn the city’s night eyes skyward. “Jason Kendall, an amateur astronomer, and Katja Aglert, a Swedish installation artist, want to turn out the lights in different parts of Manhattan and, weather permitting, illuminate the night sky. . . .
“Mr. Kendall and Ms. Aglert, 38 — who do not know each other — face daunting challenges to realize their visions. “He must persuade the city’s parks department to darken Inwood’s Dyckman Fields, which run north for about 15 blocks from Dyckman Street, on April 3 and April 4. “She has to persuade landlords and billboard owners in Times Square to cut their lights for one minute sometime this spring. . . .
“On the nights in April that Mr. Kendall wants Dyckman Fields darkened, the moon will rise early, and astronomy enthusiasts around the world are signifying the occurrence to commemorate the 400th anniversary of Galileo’s first recorded use of a telescope. . . .